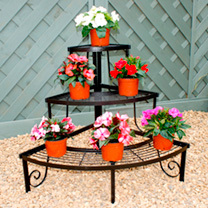 Ideal for displaying plants. British made, crafted from steel coated in durable antique black polyester paint. Three tier - Height 76cm. Depth of shelf - Bottom shelf 63.5cm (25"), Middle shelf 43cm (17"), Top shelf; 23cm (9"). Available to UK mainland only.